It was pretty close, but the Mazda 323 GTX squeaks out a 55/45 victory over the Turbo Geo Metro in yesterday's Choose Your Eternity poll. I've been happy to find some Japanese PCH candidates, of course, but it's become apparent that we've been neglecting one of the primary Project Car Hell superpowers; yes, it's been over two months since we last saw a French PCH candidate, and that's just plain wrong! PCH, Subcompact Turbo Hoonage Edition: Mazda GTX or Turbo Geo Metro? Maybe the first thing you should consider for a potential Project Car Hell candidate is its HJIYC score. Weighing in with a respectable 120 points is this '81 Citröen CX Pallas diesel (go here if the ad disappears), suggested by none other than the Loverman himself and available for just 6,000 frogskins. It would have had more points, only the latitudinally mounted "Euro-trash diesel" cost it 30 points. But don't worry about that; since you'll likely be the owner of the only Citröen diesel in your time zone, the Hell-O-Meter is going to be registering in the red part of the gauge for you... which means you get a bonus 250 Jalopnik Special Hell Project Dispensation Points. The seller of this car claims that everything works but the AC, and that all it needs is some "cosmetic tlc." We know better, of course- this car will have you looking to bust a Dien Bien Phu on France the very first time you pop the hood and stare in bewilderment at the (broken) alien devices lurking there. We recommend converting it to run on straight vegetable oil- hey, it worked for the Canola Rollaz at the 24 Hours of LeMons! That Pallas is pretty damn cool, all right, but without the 250 bonus points it's still a 120-point car on the HJIYC scale. How would you like to scorch the very flesh off your bones with a genuine, on-its-own-merits 245-pointer? Step right up, my friends, and take a gander at this '78 Lotus Éclat with V8 transplant (go here if the ad disappears)! It's got a Buick (aka Rover) 215 V8 with Edelbrock carb, new exhaust, and other goodies (including a "new interior," though that may actually mean "new to this car"). The engine has been "recently" rebuilt (which reminds me about the time when Zhou Enlai was asked what he thought was the significance of the French Revolution and he responded "It's too early to tell"), and the seller gets an Understatement of the Week Award for his statement "This car requires some small fixes (its a 30 year old british car)." But just think about how much fun this thing would be if you could banish the Prince of Darkness long enough to make it past the end of your driveway (and how much more fun it would be with a big blower sticking out of the hood)! 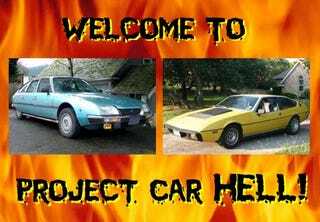 Thanks (and a half-credit towards a Project Car Hell Tipster T-shirt) to BrandonValentine for the tip.